Move Lafitte is a brand new(ish) local quintet that's been blasting out small clubs around the city for the past month or so. I'd describe their tunes are sort of an indie/funk fusion, but only if you put a gun to my head. You really have to listen to these guys to get what they're doing. Think of them as Caddywhompus' big brothers with a couple of mean horns. I caught Move Lafitte, Self-Help Tapes, and We the Grenada at Dragon's Den this past Tuesday night, and was surprised to see the new band hold their own with the other two more established acts. A day later I talked with Jason Levin, the drummer of the outfit, who was kind enough to take our little questionnaire we've thrown at some different bands around the city. I go ‘bang bang’ in Move Lafitte. It’s fun. The debut Cymbals Eat Guitars CD, ‘Why There Are Mountains’. These guys are unreal! I’m anxious to catch them live sometime in the near future. Tough to pick one, here’s my top three: Dragon’s Den (Upstairs), Tipitina’s, and I love me some crawfish at Maple Leaf. Outside of New Orleans I reside in the Delaware/Philadelphia area, a lot of great venues are around there. I’d have to say the First Unitarian Church in Philly is where it’s at. They have a great array of different rooms for concerts (small candle lit sanctuary rooms, massive basement, big church hall, etc.) and just an all around great sound. Big Rock Candy Mountain. I don’t hear enough about these guys. I got the CD a few months back and have been diggin’ it. Have yet to catch them live but definitely am excited. For me it’s all about comfort. I’d have to say my bright gold Pork Pie Percussion Thrown (seat for the layman). Two reasons, its beyond comfortable and its AMERICAN MADE! Also my double bass pedal, I have not nearly mastered it yet, but one day I’ll shred. Experimental. I mean, really what does the term even mean? I really dislike when bands use the term to describe their sound. I’m pretty sure they use it to make themselves sound distinguished and different but really it’s just a cop out. Jewels, Gems, and Gats BLAT! Fair enough. 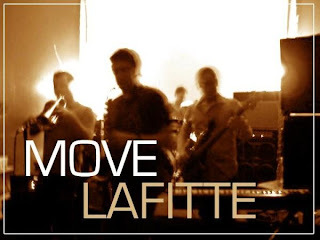 You can check out Move Lafitte at their Myspace page and they plan to play next at The Maison on April 18th.